A personal accident plan is effective where neither a health plan nor a term plan fails to deliver the desired coverage. An accidental injury, be it temporary or permanent cannot be covered by a term plan as the insured person is not dead. A health plan can work to some extent in case of temporary disability as it can cover the cost of hospitalization. But, if a massive accident has one completely and permanently disabled both term and health policies will hardly have any solution. Why a personal accident policy is crucial? Most working people in India these days possess a term plan and the number of people with health policies is also increasing at a rapid pace. Most of these people belong to salaried class and they have their daily commute to office for months and for years. Aside from daily commuting, these people also go out on roads for various purposes like shopping. Hence, the probability of meeting a road accident is a lot higher for these people. However, most of these people don’t have any personal accident policy and instead, the policies they have come to no use in case they actually meet a road-mishap. Personal accident policies are well and truly inexpensive and working class people can afford them effortlessly. If you are on the lookout for such a policy the foremost thing that you need to keep into account while buying a personal accident plan is the coverage. Depending upon your requirement, you can opt for two types of coverages. Death will be the common aspect in both sets of coverage. 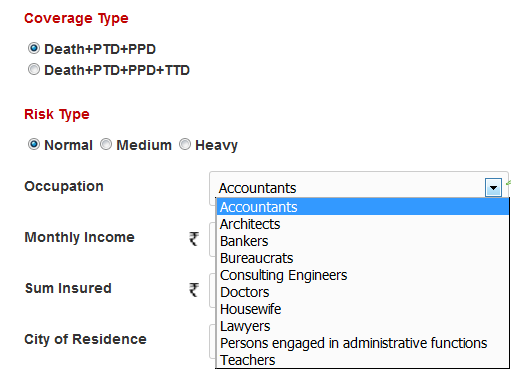 All these terms such as PTD, PPD and TTD stand for various conditions for which an insured person receives coverages. Let us discuss these terms in an elaborate manner. Both types of coverage type include death as the main aspect. In case the insured person dies out of the accident, his or her nominee would receive 100% of the sum insured. Some insurance houses also offer ‘children’s Education bonus’. Under this coverage, insured people are entitled to receive the total sum insured amount. Some insurers even provide 110% to 125% of the sum insured. Under this coverage, insured people are eligible for a small percentage of SUM assured is paid on a monthly or weekly basis. Under this coverage, policy holders receive a portion of the sum assured. Some insurers pay out the entire 100% and some others provide insured people with 50% of the sum insured. The coverage amount usually comes with an upper limit such as Rs. 5 lakh or 10 lakh. The purpose behind opting for a personal accident policy is to cover up the risks of getting involved in an accident. However, the risk factor varies from one person to another, depending upon one’s occupation. This is why occupations are classified in three categories as per the risk factor pertaining to them. These categories are normal, medium and heavy. 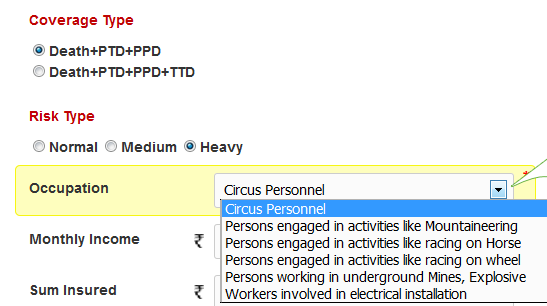 Each category comes with a specific set of occupations. The first type of risk factor is called normal risk and it includes those who are chiefly doing in-house jobs such as accountants, doctors. The second type of risk factor is considered as medium risk and people those who stay outdoors and are involved in somewhat risky jobs are included in this type. Usually, contractors, builders come under this category. The third type of risk factor is known as heavy risk and it includes people who are associated with high-risk domains such working in mines. Source: GIBL.IN How does different coverage type influence premium rate of a personal accident policy? A personal accident policy with extensive coverage protects the insured people from additional casualties. Hence, the policy comes with a little higher premium. 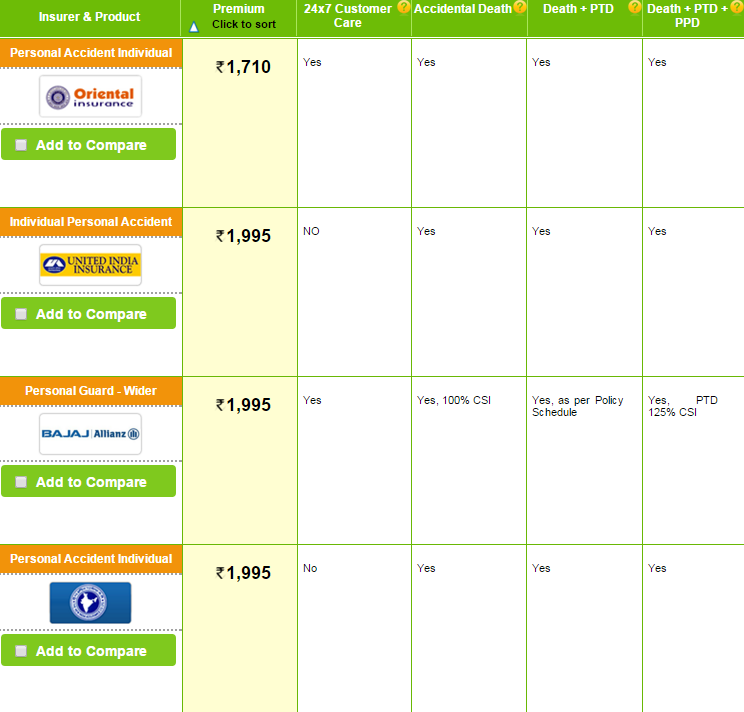 Personal accident covers that are basic in nature cost less in premium amount. Let us assume a 32 year old person is looking for a personal accident policy. The person is a banker; hence his or her occupation falls under normal risk category. The person’s monthly income is Rs. 40,000 and he is looking for a sum insured of Rs. 10 Lakh. If the same person keeps other criteria same, but opts for a plan that covers TTD the premium amount will go up as well. 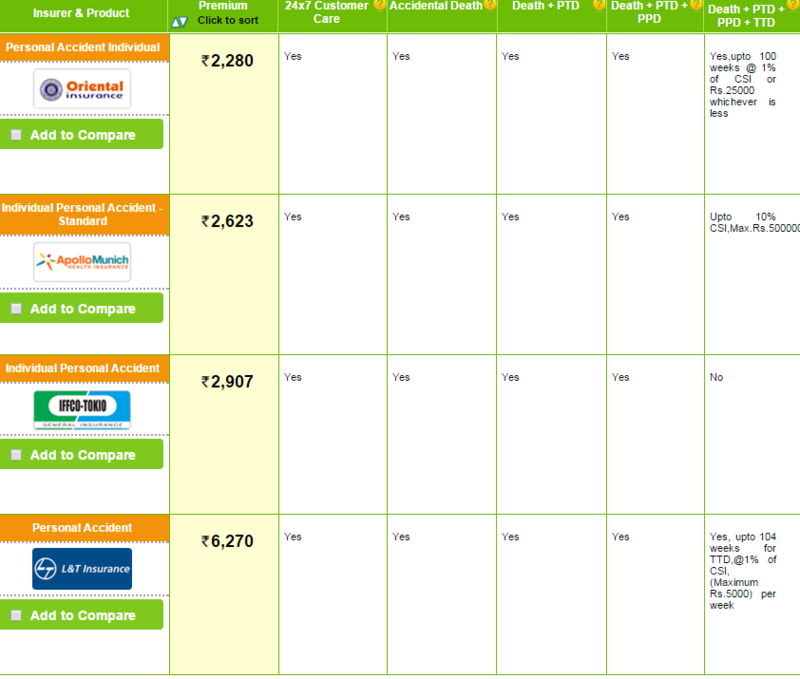 There are 7 policies on offer and the premium ranges between Rs. 1254 and Rs. 2,280. 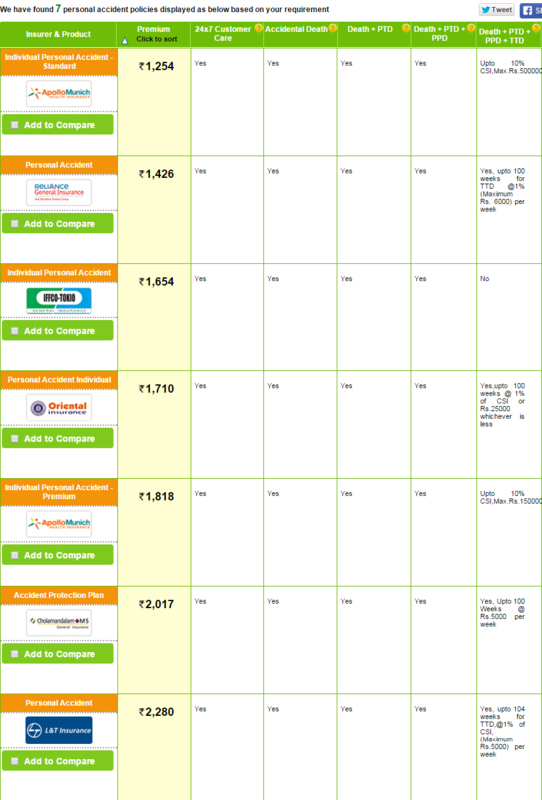 This comparison of premium clearly shows that one is better off going for a wider coverage that includes TTD too. The person has to pay just about in the range of Rs. 171(Rs. 1254 – Rs. 1083) to Rs. 618 (Rs. 2280 – Rs. 1662) more for the extra protection per year. This certainly makes a lot of sense. If the same person is a builder or a contractor, his or her risk factor is higher than those who belong to a normal risk category. If we keep all the other criteria such as monthly income, sum insured amount same and compare policy quotes that don’t cover TTD; the person will have 5 policies with premium amount ranging between Rs. 1,140 and Rs. 1,662. If the person with a medium risk occupation is on the hunt for policy quotes that do cover TTD; the person will have 6 policies with premium amount ranging between Rs. 1,426 and Rs. 3420. This premium comparison indicates that people with medium risk occupation have to pay more than those belong to the normal risk category in case of availing additional coverage. The difference of premium is higher in this case as the risk factor is more severe here. One has to pay Rs. 286 (Rs 1426 – Rs. 1,140) to Rs 1758 (Rs. 3420 – Rs. 1662) more for additional coverage. This clearly shows that the difference of premium increases as the risk of getting involved in an accident of the person also rises. People those who are associated with high risk occupations such as mountaineering or working in mines are a lot more exposed to dangers and require the best protection. Keeping all other condition same, if one is on the lookout for a personal accident plan without TTD, there are 4 policies on with premium amount ranging between Rs. 1,710 and Rs. 1,995. If a person with a similar occupation wants to compare personal accident policies that cover TTD; the person will have 4 policies with premium amount ranging between Rs. 2,280 and Rs. 6,270. The comparison of premium for policies meant for people with heavy risk occupations confirms the fact that as the risk of the insured people increases the premium amount also increases accordingly. The premium difference is even bigger as the risk of the policyholder is extreme in this case. 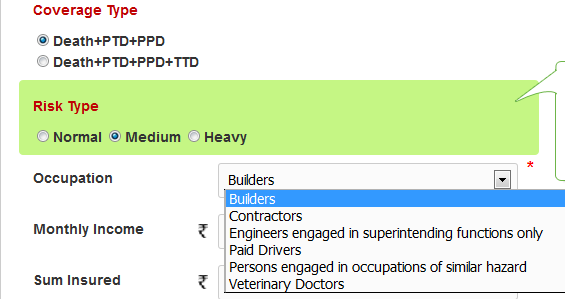 People with such dangerous occupations have to pay Rs. 570 (Rs 2,280 – Rs. 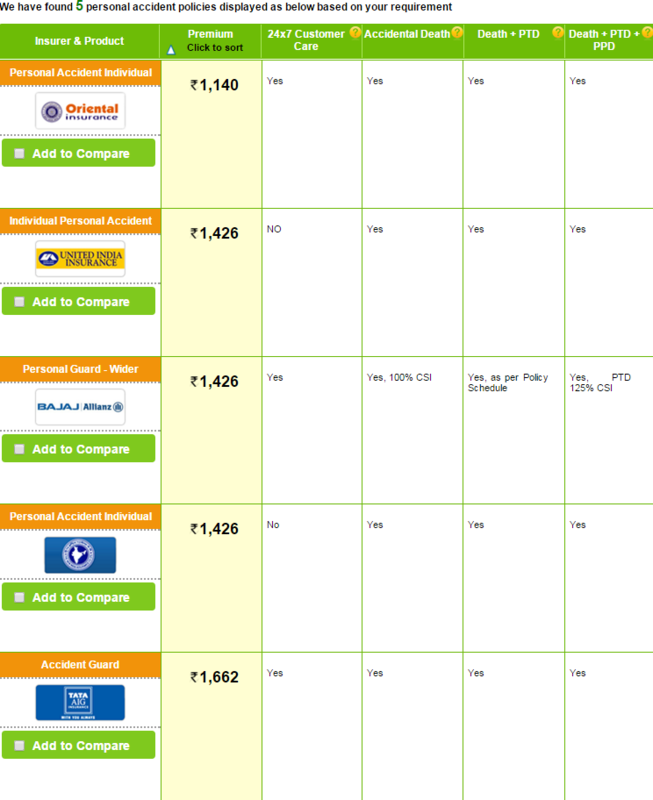 1,710) to Rs 4275 (Rs. 6270 – Rs. 1995) more for additional coverage. 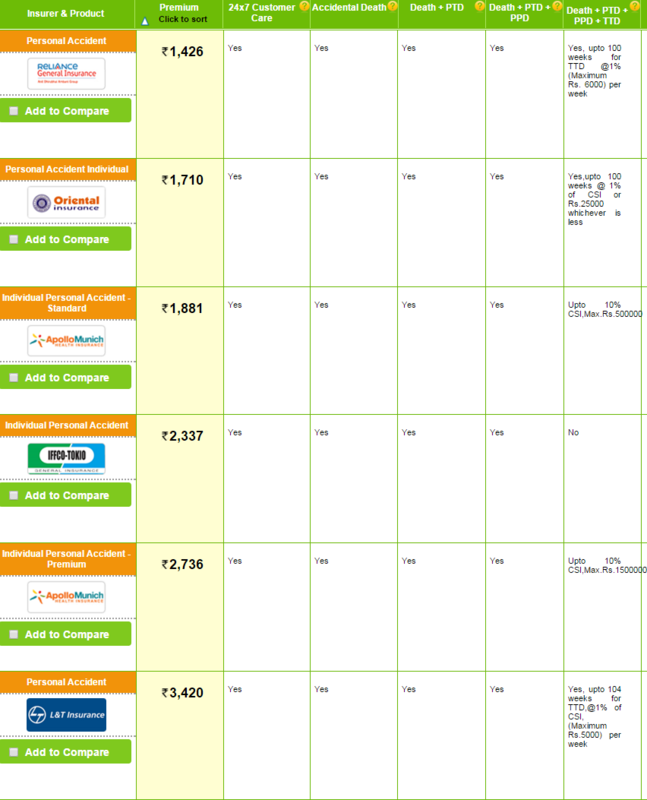 All these comparisons hints at the undeniable fact that premium amount increases if one opts for better coverage. The nature of one’s occupation also has a direct impact on the premium amount. The premium rises as the risk factor of one’s occupation gets more and more severe. Even though the premium is higher for people with heavy risk, it is advisable that they should go for wider coverage. An unexpected mishap on the road or in the workplace might cost them a lot more than the amount they can save on the premium by opting for basic coverage. 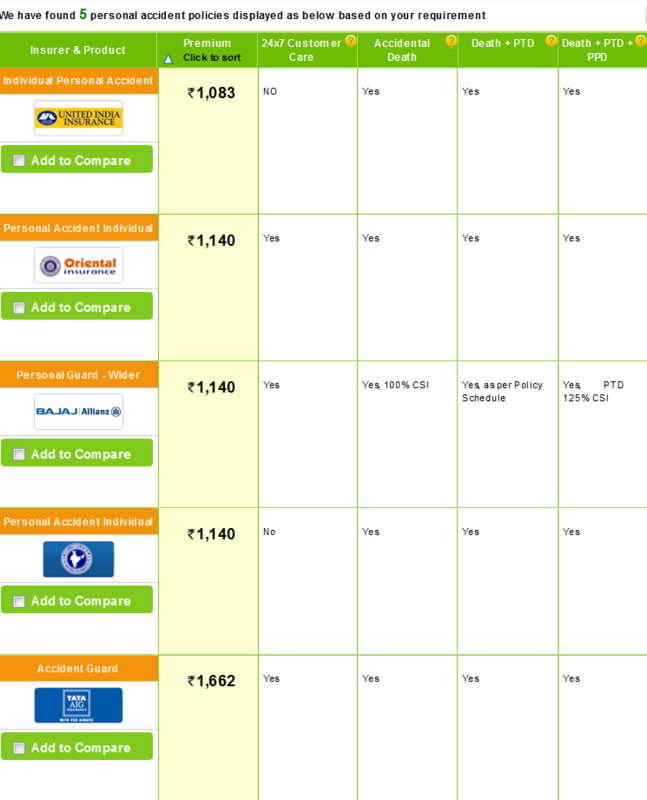 An online insurance comparison portal like GIBL can help people with all types of occupation compares the rates of personal accident insurance policies so that they can find a suitable and affordable plan for themselves.